Face Value: I love the classic mystery aesthetic here: it’s both paying homage to the genre and time period and a lovely piece of art in itself. However I’m not sure that the cover is actually all that reflective of the story inside. From the cover, I expected something very noir, and that’s not really what we get here. Still pretty though. Does it Break the Slate? Not really. Unfortunately. I really wanted it to! I wanted Iris to be an intrepid girl sleuth, existing comfortably in the world created between Nancy Drew (who we talked about on Monday) and Veronica Mars (who we’re talking about on Friday). But even though both of these young female detectives are mentioned in the back matter, Iris Anderson doesn’t measure up to the standard they set. I don’t want to fault Iris for not being fearless and competent. She’s a 15 year old girl, not a seasoned detective. It makes sense that she would make a lot of mistakes, and that’s potentially very interesting. But it’s not just her lack of credibility as an investigator that’s a problem. She’s not that strong of a character. She doesn’t stand up to others when they pick on her, or demonstrate much of a backbone when things get tough. She makes unbelievably stupid choices, and they don’t necessarily pay off. More details in the full review. Who would we give it to? I would put this in the hands of historical fiction fans before I’d give it to serious mystery readers. Haines does a great job of creating the world of New York City during the 1940s and even if it gets a bit over the top slangy at times (and Boy, Howdy it does), it’s a richly crafted portrait. The mystery…well I was disappointed, and I think that people who pick the book up because of the Veronica Mars implication in the description will be a bit let down. Review: Fifteen year old Iris Anderson has had a tough year. Her father is recently returned from the war, having lost a leg at Pearl Harbor. Her mother, a German-Jewish immigrant, committed suicide under mysterious circumstances. The family’s loss in income resulted in a move to the lower east side and a switch to public school. Her father has started up his own private detective business, but the family is still struggling to make ends meet. Iris starts to think she might be able to help her father, and plunges into her own explorations, despite his unwillingness to accept her help. The setup is compelling, and appealingly familiar. 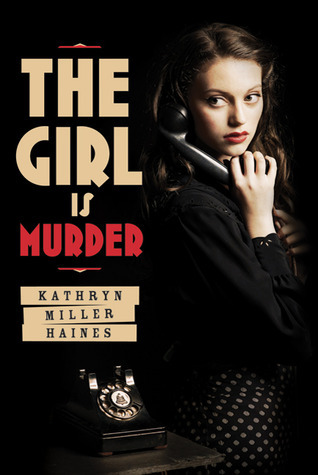 It’s a standard and effective setup for a girl detective story, right down to the lack of a mother and gruff private eye father. This kind of formulaic set up is actually not a problem for me – the writing is engaging and roots the book clearly in its time period and great books can come out of playing up these tropes. I think one could argue that many of the detective stories and procedurals that are incredibly popular achieve that popularity by sticking to a formula that works. However. Iris does not necessarily demonstrate the skill to back this up. We don’t see her demonstrate the forward thinking, clarity of mind or ingenuity of strategies to solve the cases she takes on. She does all these stupid things – she keeps secrets and tells lies and sneaks around. And then there’s no payoff. Seriously. She doesn’t actually crack the case in the end. Her father doesn’t need her to solve the mystery. In the big climactic scene, she tells him what she thinks she knows and it turns out Iris is wrong, Pop’s already solved it, and he tells her what really happened. Maybe this is plausible but it’s disappointing. At the beginning, I really thought she was going to develop her skills – like maybe she made some dumb mistakes with her first case, but we would see her learning curve. But while watching Iris do what she thinks she needs to do, I mostly found myself being frustrated with her bad choices. She often gets what she needs by crying, and when she seriously screws up her apologies are more of the “I’m sorry your feelings were hurt” variety. Throughout the book we see her take advantage of literally every person who tries to be nice to her: her Pop, Suze, Pearl, Mrs. Mrozenski, even frivolous Grace. She doesn’t do it maliciously. She thinks she’s pursuing a greater good and she thinks she’s doing the right thing. But without the high stakes of being ultimately right, it’s frustrating to watch unfold. Iris has had a whole hell of a lot happen to her, and certainly I want to give her a hug. But it’s still hard to watch a character make the same mistakes over and over again. I don’t think she’s a bad person, but she’s flawed, and we don’t really see her grow up in a way that would make her Slatebreaker. Perhaps she will in future books. This entry was posted in Reviews, Theme Week, Young Adult and tagged Detectives Week, Girl Detectives, Historical Fiction, Homefront, New York City, Noir, World War II. Bookmark the permalink. I really love your detective week seeing as mysteries are my favorite. I also set my expectations high for this book and wasn’t thrilled with it. My favorite mystery books are definently Nancy Drew, Hercule Poirot, and Flavia de Luce. Thanks! We love mysteries too, and this one didn’t quite live up to the potential we envisioned. I don’t know Flavia de Luce, is she one we should check out as far as Slatebreaking potential? Here is the summary from the official website of the amazing heroine. —Fearless and darkly imaginative, Flavia hurries to solve the murder and acquit her father of suspicion. Following the lead of its clever protagonist, Sweetness at the Bottom of the Pieis entirely inventive, fast-paced, and quick-witted, with tongue-in-cheek humour that derides the macabre seriousness of subject. I am a very picky reader when it comes to mystery but I absolutely loved this book, and I would highly recommend it, and in my mind she is definently Slatebreaking material.